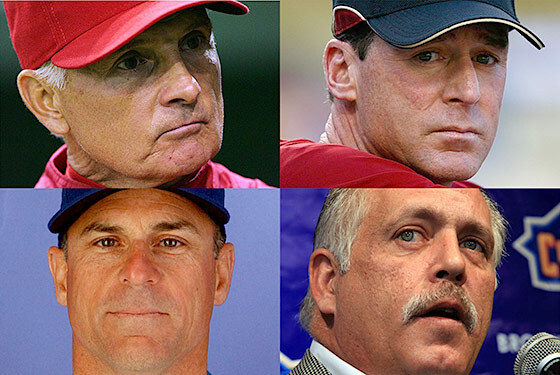 The first round of interviews for the Mets' managerial opening concluded this week, leaving four finalists: Terry Collins, Bob Melvin, Chip Hale, and Wally Backman. And though the Mets haven't sent out an e-mail blast saying so yet, it looks like they'll hold a press conference on Tuesday to announce who'll get the job. But what happened this week that didn't involve Sandy Alderson's biggest decision so far? The Jets won another overtime game, this time in Cleveland. The Giants lost at home to Dallas, in a game that saw the lights go out at the Meadowlands. After beating Edmonton and Pittsburgh, the Rangers' winning streak ended against Boston. After falling to Houston and Denver, the Knicks' losing streak (finally) ended against Golden State. Amar'e Stoudemire topped this week's Knicks Power Rankings. Stephon Marbury, meanwhile, said that he thinks Mike D'Antoni's days as Knicks' coach are numbered. The Steve Lavin era opened with a loss, while you were sleeping. The Yankees prepared their initial offer to Derek Jeter. And they also named Larry Rothschild their next pitching coach. That's it for us. Have a nice weekend.